James, or Seamus as his friends called him, was the eldest of six sons in a family of nine, born to John and his wife Bridget Quinn from Irishtown, in Illaune on July 8th 1897. As a child he walked 5 miles to and from school along the newly constructed railway line. At age 14 he left school early and began working as a labourer on farms. On June 8th 1915, James left Ballindine railway station to travel to England, where he joined his father working on a farm near Oldham, Lancashire and later near Kirks-Dogdyke in Lincolnshire. They were paid £40 for a job, which was really good money for the times, but the work was hard. With the nearing of the war, James feared he would be conscripted into the British army, he returned to Ireland with thoughts of America. November 2nd 1915, James once again left Ballindine railway station bound for Liverpool, where he boarded the St. Louis liner. He arrived in New York on 10th November 1915. He joined the American army, and in July 1918 was sent along with the New York 77th division to Chateau Thierry, France to join the fighting in World War 1. Later winning the Silver Star for bravery. After the War he returned to New York where he worked in a shipyard, and later with the Sheffield Farms Milk Company until 1924. He took night classes at the Dewitt Clinton High School on 10th Avenue. After a pilgrimage to Dublin and a short holiday with his parents and family, he returned to America, where he moved to Washington. James worked as a clerk in the House of Representatives and later in the Department of Justice. He graduated from Columbia University in 1935 with a Master of Law Degree. 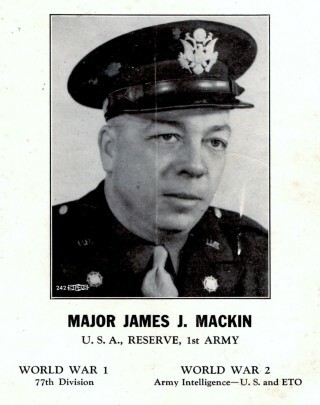 James Macken married Florence Duffy on October 4th 1936. He revelled in the hustle and bustle of the political and social life in the capital city. But soon he was called back into active military service, destined for Europe, now in the throes of World War 2. On Christmas Day 1943, he bade a tearful farewell to his wife Florence, brothers Martin and John and boarded a ship that would take him back to Europe again. 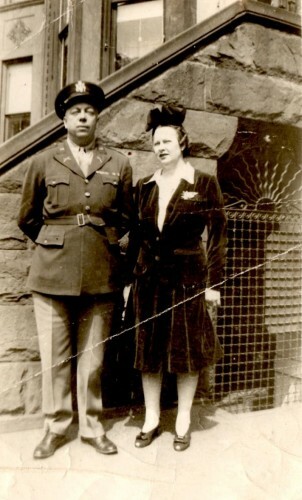 He was assigned to England where he became Port Security Officer in Plymouth. Later he was assigned to Intelligence work and cryptography in Southampton until June 1944. By now he was a Captain and was sent back to France arriving at Utah Beach. He once again took up his duty, in intelligence and was stationed in Paris at Command Head-Quarters. He escaped death when a shell exploded near his jeep while accompanying the 9th army at Ausa Lorraine, his companions were killed in the explosion. In recognition of his bravery and outstanding service, he was promoted to Major and later Lieutenant Colonel and also awarded the Purple Heart. With the war over in 1945, James visited his parents and family for a welcome rest in his home townland of Illaune. Soon he returned to Washington again where he worked in the department of Justice until 1954. He transferred to New York where he became The Director of the Bureau of Marshals in the Department of Investigation until 1965. James Macken retired on 1st January 1965 and regularly visited Ireland while his health allowed. He was gifted with an enormous sense of humour and powerful voice, with an endless stream of jokes and anecdotes. James never liked to talk about his war experiences. Remaining a devout Roman Catholic, he throughout his life had helped countless immigrants to process their papers and start new lives in the U.S.
James (Seamus) Macken, died on January 1st 1980, he is buried at the Veterans’ Memorial Park in Queens, New York.